It’s an iconic car with a colorful past. But it’s the wrong paint job, and now, with your help, the Indianapolis Motor Speedway Museum wants to do something about it. For many years, the Museum has displayed, off-and-on, a Lotus 29 which is painted in the team’s iconic British racing green livery made famous by the great Jim Clark. But an investigation into the lineage of the car has turned up some interesting information, namely that this Lotus shouldn’t be green at all. To understand how the change occurred, you must go back to the start of a revolution. In 1963, Team Lotus came to the Indianapolis Motor Speedway with a two-car team, and plenty of fanfare. Just two years earlier, World Champion Jack Brabham had brought a rear-engine car to the Brickyard, a Cooper powered by a Coventry Climax engine. Brabham brought the car home in ninth place. American Formula 1 ace Dan Gurney was impressed enough with the effort to see into the future. Gurney believed a rear-engine car based on a Formula 1 design could win the “Greatest Spectacle in Racing,” with the right engine. Gurney approached the Ford Motor Company and Lotus’ boss Colin Chapman, with a plan to knock off the aging front-engine roadsters dominating the Brickyard. Chapman brought his lead driver Jim Clark to the project and borrowed Gurney from the Brabham Formula 1 team. The result was the Lotus 29, based on the team’s type 25 Formula One car. The major difference between the cars included a longer wheel base to accommodate a larger engine, and the longer legs of the lanky Gurney, and the offset suspension to due to the fact the car only needed to turn left. Three Lotus 29’s were built and brought to the Brickyard, entered by the “Lotus Indianapolis Project.” They were married to a new 256-cubic inch pushrod V-8 from Ford. Lotus 29/1 was the “mule,” the test car that wasn’t supposed to see any action in May. Lotus 29/2 was assigned to Gurney, painted white with blue trim sporting the #91. The third car, car No. 92 and chassis 29/3, was prepared in Lotus’ traditional British racing green and yellow, for Clark. Clark and Gurney both posted speeds in the top 10 leading up to the first day of qualifications, May 18, 1963. But it all went wrong for Team Lotus early in the morning practice session, when Gurney hit the Turn 1 wall at 9:43 a.m. Gurney was uninjured, but the car suffered damage to the right front, and was out of action. While Parnelli Jones was winning his second-straight pole position, and Clark was laying claim to the fifth spot on the starting grid, Team Lotus was busy readying the backup car, and by late afternoon “The Mule” was just about ready to make its’ Month of May debut. A seven-minute yellow light caused by a straw hat found bouncing around the first turn caused a brief delay in the proceedings, but finally at 4:22 p.m., Gurney took his first laps in #93 (chassis 29/1). The Californian got just a few minutes to shake the car down before the yellow light was back on again to end practice and resume qualifications. Lotus 29/1 was put in the qualification line, and just 22 seconds before the gun sounded at 6:00 p.m. to end the Pole Day festivities, Gurney took to the track. Gurney had posted three laps at over 149 miles an hour, which would have been good enough to place him in the third row, when his foot got caught up in the throttle strap of the still unfamiliar car, forcing him to wave off the run on the final lap. On Sunday, Gurney was back, and after a brief appearance in the morning practice session, Lotus 29/1 was back in the qualifications line. This time there were no issues, and at 2:19 p.m., the car was safely in the show with an average speed of 149.019, good for the outside of the fourth row. On race day, #93 had a new paint job, blue and white, and Gurney brought it home in seventh place following two slower-than-average pit stops, including an extra stop due to the right-front wheel nut not being secured properly. Clark finished second to winner Parnelli Jones. The rear-engine revolution was now fully underway, and later in the 1963 season at Milwaukee, Clark took the first victory for the so-called “funny cars” as the Scot dominated at the Mile in chassis 29/3. Gurney ran second most of the day but finished third in 29/1, as the car he crashed at Indianapolis was still back in the UK being repaired. The cars ran one more time in competition in 1963, both dropping out at Trenton in September with oil line issues after each leading. So how did the car in the Indianapolis Motor Speedway Museum end up back in British Racing Green? Records indicate 29/1 never raced again, but 29/2, the car Gurney had crashed at Indianapolis was back on the track for 1964. The car had a new paint job, owner and driver. Bobby Marshman was behind the wheel of the newly repainted Pure Oil Firebird Special at the Speedway. Marshman qualified for the front row, next to Clark, who won the pole in Lotus’ new Type 34 creation. The Pennsylvania driver dominated the “500” early, leading laps 7-39, before he bottomed out and retired with a broken oil plug. Marshman planned to drive the car again the following week at Milwaukee, but he crashed in qualifications. The driver wasn’t hurt but the car was badly damaged and was sent back to the UK once again for repairs. 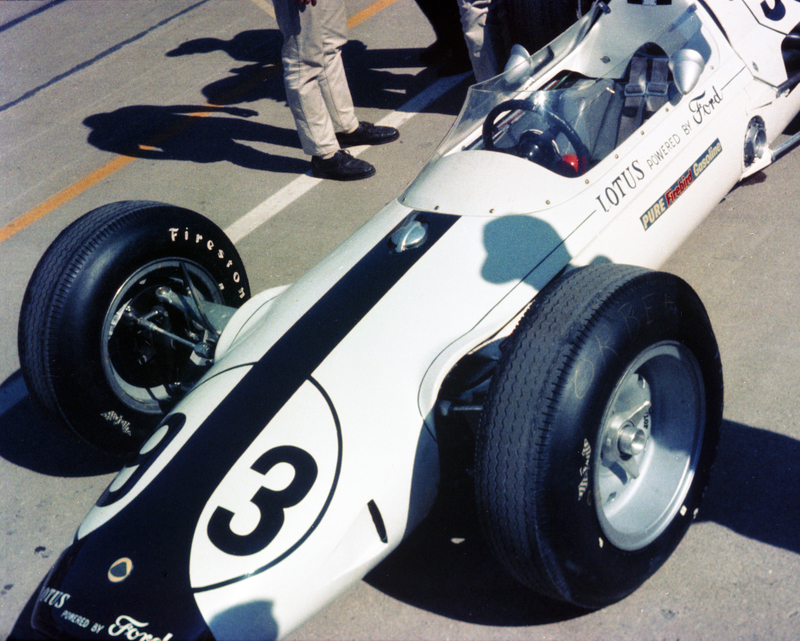 It’s believed that Marshman’s car owner Lindsey Hopkins then made a deal to purchase chassis 29/3, the car with which Clark finished second in at Indianapolis and won Milwaukee in 1963. But Marshman never had a top-10 finish in the car, and it’s believed that 29/3 is what he was driving when he crashed at Phoenix November 27, 1964 during a tire test. Marshman died six days later. Chassis 29/1 remained the property of Ford Motor Company, and with the accident that destroyed 29/3, it’s believed that the company repainted the car to commemorate Clark’s achievement, although the Scottish superstar had only driven the car briefly in testing. The car was donated to the Indianapolis Motor Speedway Museum in 1973, and now the Museum wants to restore the car to the way it looked May 30, 1963, and get the iconic car back on the track. In addition to changing the livery from the traditional Lotus green back to the blue-and-white with which it ran the race, the car needs new fuel cells, tires, suspension and engine maintenance to return it to running condition. The estimated cost of the project is $90,000, which the Museum hopes to raise through donations. The Lotus 29/1 is the first in a series of four restoration projects the Museum has planned over, which include both racing and passenger cars from the outstanding collection. The Indianapolis Motor Speedway Foundation is a nonprofit organization recognized under Section 501(c)(3) of the Internal Revenue Code, as amended. Donations to the Foundation qualify for charitable deductions to the extent permitted by law and by the donor’s personal income tax circumstances. If you would like to contribute to the project you can mail a check to the Indianapolis Motor Speedway Museum, 4790 W. 16th Street, Indianapolis, Indiana, 46222or you can visit the Museum’s website here.